A ban on plastic bags is coming into effect in Italy, which has one of the highest rates of consumption of the bags in Europe. The ban begins in shops across Italy on 1 January, with only biodegradable, cloth or paper bags to be offered. Italians use 20 billion plastic bags a year - more than 300 per person. Supporters of the ban say plastic bags are an environmental hazard which use too much oil to produce and can take decades to break down. 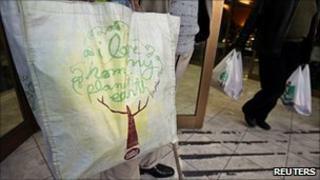 The law for a gradual ban on plastic bags was introduced in 2006. The original deadline of January 2010 for the completion of the ban was delayed because of opposition from industry. Italian retailers have complained that the decree pushed through last week to enforce the new deadline lacks detail. Environment Minister Stefania Prestigiacomo said the decree marked "a key step forward in the fight against pollution and it makes us all more responsible in terms of recycling." The government has a public awareness campaign that promotes other types of bags as fashionable as well as environmentally friendly, she said.